Love her or hate her, Rachel Berry is Glee’s true main character. She may not be the first character we’re introduced to in the Pilot, but as soon as we see her hopeful little face shine through that burning gold star, we know exactly who’s going to be running the show. The idea that Rachel Berry is Glee’s main character is part of what makes (or made, originally) the show so great - Rachel Berry is an atypical lead for a mainstream television show. Take, for instance, the first moment Rachel is on our screen: she is storming down a hallway, and gets a teacher fired for an offense we are not entirely sure he committed. From very early on, Rachel is presented to the audience as a force, an overwhelming ball of ambition and energy who has trouble connecting to others. She’s not always likeable, which is a bold (and commendable) move for the showrunners. Still, the construct of Rachel Berry as a main character is what provided much of the original verve of the show, identifying it both as a fresh and irreverent satire and a charming exploration of high school misfits. Combined with Sue Sylvester as Chief Adversary, Rachel Berry drummed out much of the quirky heartbeat which told us that Glee was marching to its own rhythm. Rachel Berry is, therefore, why Glee works. Rachel is a personification of the show, an embodiment of what it means to be at the bottom of the high school food chain - a true loser and “Gleek.” And as an extension of this idea, Glee wields Rachel Berry in an interesting way: she exists both within the narrative and also as a construct of it. We, as an audience, are meant to laugh at Rachel, but also cry with her - almost exclusively. Consider her character intro in the Pilot. She delivers a cheery, upbeat monologue about her two gay dads and how she’s spoiled and is going to be famous one day, and we’re all chuckling at this character’s gall and naivete - she’s a bit silly. But then, in an instant, we’re introduced to the idea that not only does this girl get treated terribly by her peers, but that it affects her. Bullies boldly message her on the computer to tell her to get sterilized - they don’t even hide who they are - and we see that heart-shattering look on Rachel’s face as she reads it. Rachel Berry knows people hate her - knows exactly which ones, and when she’s completely alone, it completely tears down her bravado. In this single montage, Rachel Berry is created and defined, for every subsequent episode of the show. She is the show’s main clown - at one moment tap dancing and shilling for solos with a somewhat unhinged zealousness, but in the next, completely destroyed by her inability to fit in with her cruel environment. Hardly any other character gets this treatment to such a degree, and it was this original stratagem that gave Glee its voice. Rachel Berry represented the entire show as its headlining tragicomic, a show choir loser who spouts crazy but emotes genuine - much like Glee itself. Glee started out as the Rachel Berry of the TV world, a singing and dancing misfit that had a lot of zany dialogue, but that would surprise you with real and honest moments of touching vulnerability. Not only that, but Rachel Berry has historically been allowed victory. She is the show’s main character, and even though we laugh at her folly and cry with her anguish, she is afforded the opportunity to succeed in the sphere of Glee Club, winning us over with her triumphant voice, and sheer stage presence. In the meantime, however, our hearts ache for her social pitfalls, and we root for her to have the chance to shine for people who refuse to see her as anything but an annoying talent. We want Rachel to succeed because she is so charming in her self-absorbed eccentricity and reliable insecurity. And on top of that, if Rachel Berry succeeds, it means that the Glee Club as a whole can succeed, and fosters the message of the show: that just because you’re unpopular doesn’t mean you’re not good at anything, or that you can’t triumph over adversity. Once again, Rachel is reliably the embodiment of what Glee, as a show, is all about. Since the show’s inception, Rachel’s role within the narrative has largely been unchanged. She is steadfast as the show’s main character, a comedic punchline and an emotional anchor. Of course, treating Rachel Berry solely as a main character has on occasion become problematic for the successful execution of the show. Trying to keep Rachel involved in storylines simply so Lea Michele can sing Barbra Streisand or show off her abs has led to moments like “Papa Can You Hear Me” and “Hit Me Baby One More Time,” which unfortunately make little to no sense within the narratives of the episodes. This becomes further complicated in that giving Rachel the bulk of the solo opportunities isolates her from the other characters, when she is already a character in isolation. The show has made little effort towards giving Rachel any friends until the second season, which is unfortunate. However, this isn’t as much a reflection of Rachel’s character as it is an expression of the shortcomings in writing choice. We’ll explore that further in the next portions of this epic. But for now, it’s difficult to argue that anyone other than Rachel Berry could be Glee’s main star. Rachel is a personification of the show’s main themes, and a huge contributor in carving out the niche that Glee has created for itself in television history and as a pop culture phenomenon. She remains, arguably, the show’s greatest character creation as a result. Well said and set up. As much as I am occasionally irritated by Rachel, she is my main character. I like most of the characters, some more than others, or like to hate a few, but without Rachel I'd stop watching. This is just lovely, so thoughtful and well-processed. Rachel is just, I don't know, I actually love her so much I can't explain how I feel about her because for one, there aren't enough words in any language, and two, I adore her so much (and enjoy being able to adore her!) that I can look past any fault other people pick at. Honestly, she invokes the kind of whip-lash reaction in me whereby anytime ANYONE critises her in anyway,be it a character on the show or a real life person, I just feel more protective of her and more affectionate towards her. I realized how ridiculous I'd become last year when Lea Michele kind of critized Rachel and no lie, I kind of wanted to slap her. I dont even care if that's crazy anymore though, Rachel makes me enjoy Glee more than anything else in my life at the moment, so why on Earth would I want to do anything to justify that? Let me put this verbosely: THIS SO HARD! My only concerns with the lazy (or ignorant) writing of Rachel is turning these original issues of vulnerability and bullying, into storylines revolving boys/Finn. "Get It Right" was so not about a love interest, but rather it connects with the Rachel Berry character we've seen from the beginning. The girl who tries so hard to be special that she positively breaks inside with every slight (or epic) failure, misstep, and nasty remark from the peers she so desperately yearns to make her friends. I think being the person who "wants everything too much" is why so many viewers connected with Rachel. The girl who was bullied and affected by it, but could still pick herself up and BE herself... that was a heroine for every person who has ever felt picked on or kicked down or generally "never good enough." I mean hell, her own mother picked Quinn Fabray's baby over her biological daughter. That is some messed up stuff! It is terribly frustrating to see such a rich storyline and rich character be skimmed over in favor of Finn. Achelesox - Thank you! I admit; I've had a hard time writing the pieces for Rachel Berry Week because I love this character fairly unconditionally. I tend to be an apologist for her flaws, but I don't want to be completely biased in my write-up! Framo - Haha, thanks! I'm with you on the excess of boy-related storylines for Rachel. It's getting exhausting/depressing watching her throw herself at so many guys when I just want to tell her that she doesn't need to change for a guy. I love your analysis of Rachel Berry. She's not perfect, but she's amazing and her journey is why I watch Glee. So incredibly sad. 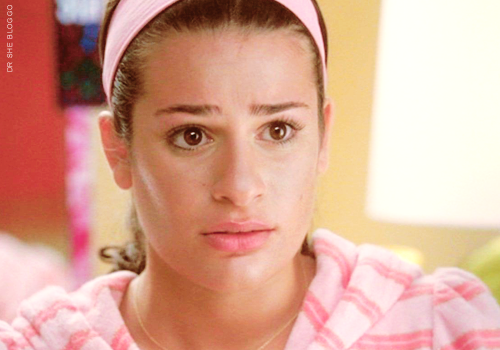 DAMN Lea has an expressive face. I'd agree with Rachel as the main character. No question about it. Her intro carried some serious power. I'd ARGUE that she and Will are the main characters of the show, or at least the first season. You know, I never doubted that the Pink Dagger (actual name forgotten) actually was doing something seriously inappropriate with a student. Pretty much everything we know about him leads me to think he did it. I never thought of it that way. I love characters who aren't always likeable. Love and like are different things, especially on TV. Perfectly said. I never really thought about it that way before I read this, though I read it a while ago so I've internalized it. Rachel is the incarnation of Glee, especially in the first season. Now I would say that this declines later on, as other characters take the spotlight some of the show's power changes, but that would best be discussed in profiles for other characters. I think that one of the show's main issues is that it is divided between Rachel's status as a main character and the rest of the show's ensemble cast. Anyway, onto part 2.